What do sailors do all day? What’s new, you ask? We’ve just added a line of hooded zip-front sweatshirts to keep you warm until next summer. Available in red, royal blue, and black, they have a compass rose and Good Old Boat logo on the front and are priced at $45. They work well as holiday gifts for skippers and crew, as do our T-shirts and ball caps. To see them, go to: http://www.goodoldboat.com/books_&_gear/clothing.php. We’ve moved to a bigger and better booth in Annapolis. Stop by and see us at AB8 not too far from our previous spot at AB3. Now we’ll have room for everyone to come in out of the rain, or the scorching sun, or the wind, or whatever the weather gods decide to inflict upon us this year! As usual, bring your sense of humor. We’ll do likewise and greet you with smiles no matter what the weather does. Our digital shelf is figuratively sagging under the weight of (wait for it!) two eBooks. First there was Marcie Lynn’s book about her Caribbean adventures with more travel books yet to come: Nine of Cups’ Caribbean Stories. 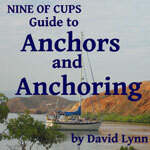 To that we’ve added David Lynn’s eBook about anchoring: Nine of Cups’ Guide to Anchors and Anchoring. David will be adding further technical eBooks when he has time between crossing oceans and writing articles for Good Old Boat as one of our newer contributing editors. Both books are available for download in PDF format at our downloads site: http://www.AudioSeaStories.com. Caribbean Stories is $3.99 and Anchors and Anchoring is $4.99. OK, so your editors don’t exactly embrace change, but we generally do come along kicking and screaming when something new is imposed upon us. Perhaps it’s part of the good old concept of this magazine. Whatever the cause, we tried to ignore Twitter. But we have capitulated and are learning to Tweet. It’s like learning a new language, so please go easy on us as we make an effort to catch up with yet another cultural shift. Find us @GoodOldBoat. We’re somewhat more comfortable with Facebook (since we’ve been at it for a couple of years now and have more than 3,300 followers there). Find us there at facebook.com/goodoldboat. Water expands in volume by about nine percent when it freezes, creating a staggering force that can crack a boat engine block, damage fiberglass, split hoses, or destroy a boat’s refrigeration system overnight. As fall approaches, Boat Owners Association of The United States (BoatUS) recently dug deep into its insurance claims files, unearthing a trove of winterizing-related boat insurance claims and found that more than three-quarters involved cracks in the engine block or the exhaust manifolds. Now, the national boating services, safety, and advocacy group is making available, at no-cost, the 15-page “Boater's Guide to Winterizing” that can make the task easier for any type of boat. The downloadable brochure addresses the reasons for more than 95 percent of the freeze claims handled by the BoatUS Marine Insurance Program in the past decade. Included are chapters on: Storing your boat — The options and the tradeoffs; a Winterizing Checklist to use as the starting point for creating your own boat’s winterizing list; Engines and Drives — The dos and don’ts; and Plumbing — Getting the water out, which is great for larger boats. The checklist is available at <http://www.BoatUS.com/winterizingguide>. With the school year starting this November, the Great Lakes Cruising Club School will offer over 40 webinars, many of them new. Taught by industry specialists and GLCC-accredited sail- or powerboating colleagues, the school’s highly affordable classes cover everything from weather to maintenance, provisioning to navigation, safe boating to anchoring techniques, regional cruising guides to locking skills . . . and more. Each of these classes is easily accessible from your home computer or tablet. In addition, the school has expanded its regional Great Lakes cruising webinars with two new Lake Huron classes, a new webinar covering Lake Ontario, and a new webinar covering additional cruising grounds within Georgian Bay, while also adding several new boating skills classes. To support its expanded class offerings, several new instructors are joining the faculty this year. For example, Liza Copeland, who has cruised over 160,000 miles, will be offering new classes on the technical and practical realities of cruising, and Great Lakes marine weather expert Mark Thornton will demystify the meaning and interpretation of Doppler weather radar products in his new class. These and other instructors join numerous other distinguished faculty members such as past Cruising Club of America Commodore and Safety at Sea expert Sheila McCurdy and Starpath radar expert Larry Brandt. Live, real-time on-screen presentations with visual aids provide an opportunity for participants to interact with the instructor and each other in a virtual classroom. Sessions typically run 60-90 minutes. On average, webinar registration is only $20, discounted to $15 for current Great Lakes Cruising Club (GLCC), United States Power Squadron (USPS), and Canadian Power and Sail Squadron (CPS) members. If scheduling doesn’t allow someone to attend a live webinar, they have an opportunity to view a recording of the live event on demand at a later date. In addition, selected previously broadcast webinars are periodically made available for recording-only registration. For further information and a list of subjects, instructors, and costs, visit: <http://www.GLCCSchool.com>. This year’s Hospice Turkey Shoot Regatta, held annually on the Rappahannock River in Virginia, will take place on October 3 to October 5, a week earlier than the traditional Columbus Day weekend. John McConnico, the regatta committee chairman, says the change was made to accommodate sailors who wanted to participate but who had conflicting commitments over the Columbus Day weekend, notably the Annapolis Sailboat Show. Last year, the venue was moved to Irvington on Carter Creek off the Rappahannock River. Rappahannock River Yacht Club and Yankee Point Racing and Cruising Club are hosting the regatta together with Rappahannock Yachts, which is providing the site for the waterside event tent at its recently expanded marina. The Tides Inn, a short dinghy hop away, is sponsoring a prize for the regatta’s overall winner that includes a complimentary room for two for two nights and a complimentary slip at the Tides Inn marina, both to be used in conjunction with the 2015 regatta. To enter the regatta, boats must be of a design that is at least 25 years old. Registration and more details can be found on the regatta’s website, <http://www.turkeyshoot.org>. The 45th Annual Sailboat Show is the oldest in-water sailboat show in the world. For more information and to buy tickets, go to <http://www.usboat.com/us-sailboat-show/home>. Don’t forget to stop by Good Old Boat's new location, booth AB8, to meet Jerry, Karen, and some of the crew. Charlie Chaplin said: “A day without laughter is a day wasted.” Abundant fun and laughter will surround the annual Elf Crab Feast on Saturday, October 11th at 1:00, which will also offer crabs, delicious foodstuffs, a silent auction, beer/wine and desserts. All donations of foodstuffs and silent auction items are welcomed. It may be a good time to empty the garage and home closets. Bring a dish to share. The cost for members is $45 per person and $55 for non-members of the Classic Yacht Restoration Guild. Spaces are limited. Payment should be made by Tuesday, October 7. Send your check payable to CYRG to P.O. Box237; Earleville, MD 21919. Questions? Call Captain Rick at 410-275-2819 or go to <http://cyrg.org> for details. I’m looking for info on Captiva 240 . . . good and/or bad. Any and all information is appreciated. If you have any information about Captiva 240, send it to Randy at Randy.Cardoso49@gmail.com and copy Karen (Karen@goodoldboat.com) so it can be published more widely — Eds. I'm looking for any information on Blueocean 42s. The designer is Norm Nudleman and I think five were made. I have one that was constructed in Lima, Peru. It's all aluminum and is currently undergoing a full refit in Maryland. Does anyone have additional info? I am writing about partially developed seas, the only kind we encounter on the Great Lakes. I would like to have an authoritative source to talk to. The Coast Guard, NOAA (at least, the phone numbers I have), and the Corps of Engineers were not helpful. I need somebody who is expert or knows where the expert can be found. A table of fetch versus wind velocity with respect to height, period, and velocity of waves would be ideal. An expert would know about spill, surge, and the like. Can you point me in the right direction? Maybe a professor or institution? If you have a suggestion for Corky, email him at errosan@roadrunner.com and please copy Michael Facius (Michael@goodoldboat.com) because many people are interested in the topic. A few years back I watched a grainy black-and-white video of the Beach Boys playing “Sloop John B” (promo video) on the stern of a large sailboat. I later learned that it was their own Islander 55. I have been unable to find that video again. I just received the latest issue of Good Old Boat and was pleasantly surprised to see the ad for Stan Rogers' CDs on page 63. In my first week of university (back when good old boats were good young boats) I was introduced to his music when he performed as a guest of the featured performer at a concert in my college. Stan's voice overpowered the sound system so they shut it off while he sang. He filled a room 170 feet by 50 feet with a 20+ foot ceiling with his voice just as though he was singing in your living room. For anyone not familiar with his music, I highly recommend that they buy one of the CDs. They won't be disappointed and, most likely, they will buy more. Sadly, he died when he was just at the beginning of his career so what you see in the ad is all that will ever be available. You’ve heard the question. Most folks think there’s not much going on out there on a s-l-o-w moving sailboat so there must be nothing to do. How can we possibly occupy our time? Well, we opened that question up in a few Facebook feeds (facebook.com/goodoldboat) and we Tweeted about it too on Twitter (@GoodOldBoat). We got some great responses. If you think of more send them to Karen@goodoldboat.com or add to the Facebook or Twitter (#whatsailorsdo) conversations. Gregory Garms – Also port to starboard. Carmen Russell ­– This is so true! We’ve had our boat for a year. Seems to me that’s all we do! Brent Putnam ­– Curse at the buzzboats. Jon Brooks – My wife would say I spend all my extra hours varnishing in the off-season and bailing out rainwater the rest. Rob Legate – Cursing and feeding spiders to the fish. Janko Puls – They are simply . . . messing about. Vern Pratt - Just trying to figure out what I did with that expensive thingy that I was going to use to fix another thingy. For fun, I review my list of tools that I have donated to the fish. Ed Reiss – Coil lines. Endlessly. Bob Rouda – Repair. More repairs. And repeat. Jimmy Traband – Spend eight hours getting where powerboaters take 45 minutes to go. Matthew Talty – Remember: Real sailors sit in the wet spot. Brian Bills – I like to laugh at the powerboaters as they go by. Especially one guy in my marina with a cigarette boat. We laugh that he spends more in gas just pulling away from the dock than I will all year. Paul Swiatlowski – I think the larger question is what DO you do with a drunken sailor? Parsons Witbeck Clark – Putter . . . when not sailing, of course! Stephen Soblo – Repairs, clean, repairs, clean, dream about a bigger boat, repairs, clean . . .
Colin Mombourquette – What do sailors do all day? Live the dream, of course! Jackie Stevens – Chill out . . . scramble . . . drink coffee . . . relax . . . adjust the sails . . . curse stink boaters for fly-bys and wakes . . . all while grinning about not spending a week’s wages on gas to enjoy the boat. Carles Tri – For me, sailing is the closer thing to doing nothing. And that’s why I like it! John Iscaro – Measure, measure, measure for the next project. Jeremy McGeary – Build boats out of office supplies and dream about where to take them. Benjamin Kieran – Trim the jib. Trim the main. Squint. Trim the jib. Trim the main. Check Windex. Squint. Trim jib. Trim Main. Tacking in 3 . . .
Good Old Boat – Buffing season. Varnishing season. Sailing season. Winterizing season . . .
We couldn’t get enough on Facebook, so we started another thread. Good Old Boat – They repair, test, repair, test, repeat. Rich Dodson – And varnish teak. Keith White – Get up early, bike or walk, then read, eat, do boat project, eat, nap, do boat project, eat, watch video, read, sleep, get up early, bike or walk . . .
Brent Putnam – Sand, sand, sand . . .
Gordon Pipkin - Show the rednecks a new hobby — that there’s something better than fishing and jet-skiing. Richard Gibson – We may varnish, repair, test our boats but at the end of the day we can make jokes about how little gas we used during the day. Try that if you’re a powerboat owner. John Lynker – All those Ahhh moments underway and sharing a bottle of port in port! Douglas Christie – And when everything is caught up for a minute we plan the next project . . .
Thomas Wells – Other than the obvious “Sail, repair, repeat” routine, we use much of our time simply appreciating how fortunate we are to share sailing with those of like mind. We can honestly say we have met more great people because of sailing than through anything else we have done. Good Old Boat - They wait for the rain to stop. They wait for the wind to fill in. They wait for the wind to moderate . . .
Chris Kleinfelter - And they also serve. Parsons Witbeck Clark - I’m not sure sailors wait for anything. What do sailors do? Here are junior sailors at Port Clinton Yacht Club on Lake Erie. Linda Gulas Sprenger took the photo of her son Ben, Will Taylor, Lucas Kyle, and Brendan Noonan. They are all part of our junior race team. We had gusts to 30 knots so it was too much wind for sailing. And THAT’S what sailors do all day! To my surprise, when opening the mail today I found the new September 2014 issue and the great article on my new boat. I bought a 1987 Pearson 27 (hull #44) two weeks ago. Mine is the tiller model, which has a lot more cockpit space. One thing your article missed is that the Pearson 27 came standard with a manual Whale bilge pump, not a 12-volt electric one with a float switch like I’m installing on mine. My P-27 came through the survey with the bilge pump as the only item to replace or fix. Everything else was in above average or excellent condition. I can’t wait to spend time sailing around Annapolis on Discovery. I just wanted to congratulate you all on another great issue of Good Old Boat (September 2104). From the cover photo to the last article, it was an enjoyable read. Of particular interest was the Mail Buoy letter from Robert Green on the Heritage 35. That boat fits right in with the New Age of Sail exhibit article that preceded it. It seems that Heritage Yachts, founded in Oakville, Ontario, in 1974, went out of business in 1976, at which point the tooling was acquired by Grampian Marine, which in turn closed its doors in 1977. The tooling was then acquired by Cape Dory, who put the boat into production as the Intrepid 35. It’s a good example of boat tooling having a long life, often outliving the companies that produced it. I read about the International Folkboat restoration in the September 2014 issue. Nice. For more information on the boat and to see a perfect restoration of a Marieholm 26 Folkboat (approved by the original owner of the Marieholm company in Sweden), please visit <http://www.marieholm26.org>. There have been more than 500 unique visitors to this blog. It offers inspiring projects for many Marieholm 26 and IF owners. I had been looking for a way to keep a forward hatch open during inclement weather so it can provide ventilation. I saw a foredeck awning offered a number of years ago in a boating catalog, but it’s no longer available. Based on what I remembered, I took measurements for my sailboat, made a drawing, and commissioned a local seamstress to make a shade for me. It cost me a total of $225. The one in the catalog (which was much smaller) cost about $175. Maybe other sailors will be interested in making their own or having one made. I recently had Derek Leslie of Sailors Moving Sailors transport my 30-foot Seafarer from Kentucky Lake in Tennessee to Lake Hartwell in South Carolina. I highly recommend Derek Leslie to anyone who needs to move a sailboat. He is a very experienced sailboat mover who does what he says he will do when he says he will do it, and his price is very reasonable. He has the equipment to float a sailboat onto his custom-built trailer, decommission, transport, recommission, and launch. He is also capable of performing maintenance on your boat while it is in his hands. The whole move was handled exclusively by Derek. He is the only person I will call when I need to move a sailboat in the future. I thought your readers might be interested in this information. Sailors Moving Sailors is a Good Old Boat advertiser and I am very happy I found Derek for my move. Jerry, I like what you did with the refit on your C&C Mega 30. I found my Mega in a landfill and restored her into a Mega Putt-Putt. Déjà Vu took me only three years to refit. I question the wisdom of running wing-and-wing on a Freedom 28 (July 2014) with an unstayed mast when one has the opportunity to trim the sails past 90 degrees to improve efficiency and reduce the risk of a jibe. Setting the booms at 90 degrees creates a barn door effect with dead air ahead of them. Allowing the sails to be trimmed up to 30 degrees past 90 creates a vacuum, providing the sail with greater drive while reducing/eliminating the risk of an unintended jibe. I have never sailed on a Freedom, so I do not know how it would respond to sailing wing-and-wing with sails set past 90 degrees, but I do know that it improves the performance of a single-mast unstayed rig such as a Nonsuch. Years ago, I fell for the Freedom 40 design when I first saw it. The simplicity, practicality, and seakindly hull and rig attracted me. It helped that I was a fan of the Olympic Finn too. Unfortunately, my situation never permitted me to own a Freedom 40 and I never saw one until the 1990s, when one anchored off our cottage on an island in the Inner Hebrides. She had just completed a transatlantic, but looked as if she had been prepared for a boat show. This polished green Freedom 40 lived up to my expectations and more. It was a pleasure seeing her bobbing at anchor a few hundred feet from our front door. The popular Uniden QT-206 depth sounder will provide reliable service for many years. However, the clear plastic window will eventually become cloudy and even with waxing and polishing, the LCD numbers become difficult to see. It is easy to replace this window with a flat piece of the clear plastic packaging that is found on almost everything these days. This plastic is clear, tough, and somewhat flexible. And don’t we all hate cutting the item we purchased out of such packaging! Remove the depth sounder from the bulkhead. Break loose the silicone sealant and gently swing the cap down (it will swivel on wires connected to the cap’s push-button switches). With a razor, cut out the cloudy plastic window. Cut a flat piece of the packaging plastic so it will fit inside the cap with lots of space around the window. You’ll need to notch the plastic to fit around two standoffs. Put a thin bead of good quality sealant/adhesive, e.g., 3M 5200. (I wouldn’t use regular silicone for this.) Make sure the sealant is far enough from the window that, when you press down the plastic window, the sealant doesn’t ooze out into the window area. Set the plastic window in place and gently press it down to ensure a good seal all around the window. Place some nuts and bolts or other small weights on the plastic to hold it in place and flat while the sealant cures. Be patient. For 5200 this will take at least 24 hours. Once the sealant is dry, remove the old silicone from the cap and body and apply a bead of new silicone. Replace the cap and screw it in place. You should be good for several more years of clear viewing! It is important to keep moisture out of the depth sounder or you will start to have blacked-out pixels in the LCD display. I just wanted to let your readers know there is a new website for owners and potential buyers of Bristol sailboats at www.bristolsailboats.org. The website is a joint effort of people on the Bristol owners email list on Yahoo. Until now, there hasn’t been one website where people could go for information on Bristols. Blogs, reviews, brochures, line drawings, and specs are scattered all over the Internet, making it difficult to find what you need. The new website not only has owners writing about the sailboats, but also points to all of the other websites with Bristol information. As time goes on, we’re hoping to expand the website with more how-to information, interesting stories, and advice for Bristol owners. We also have a photo gallery that now features a couple dozen Bristols owned by people on the email list. We’re hoping to expand the gallery as more Bristol owners send in photos of their sailboats. Send it all to jackbrennan333@outlook.com. We received our Good Old Boat September 2014 issue and were delighted to be acknowledged as members of your “family album” (page 44). For 12 years, we have looked forward to receiving our next issue. A few years ago, we began renewing our subscription annually at the U.S. Sailboat Show (October 9-13, 2014) in Annapolis and have enjoyed engaging in interesting discussions with Karen and Jerry and obtaining a CD of previous issues. This personal engagement distinguishes Good Old Boat from all the other sailing magazines we have subscribed to over the years. We are no longer subscribing to most of the others. Here’s a picture of the view I saw upon waking up at 6:30am in Shaw Bay off the Wye River (pronounced “Y” river not “wee” river”) over the Labor Day weekend. When I saw the red sky I had no doubt, I was receiving a message, “Red sky in morning, sailor take warning.” We had breakfast, raised the anchor, were underway before 8:00am, and returned to our slip on Magothy River via the recently dredged Kent Narrows at 3:00pm. The thunderstorm followed at 4:30. I really enjoyed the article on lightning. This shot shows the fallacy of “following the shortest route to ground”! Your comments leave me in a quandary, however. Which way should I rub my tummy while standing in the shower? Clockwise or counterclockwise? I worked on it for part of two days and took it back to the Chief. He checked it out, nodded, and put it away. That night as we stood forth to shoot stars, the Chief asked the Navigator if he wanted to use the backup sextant? “That piece of junk! ?” “The Kid has tightened it up to where it's better than yours!” That may have been the best compliment I ever got from a Chief. One trick I learned from that Chief was that sextants are made wrong. They are designed to look at the horizon (easily found) and swing the arms until you find the star (hard). Turn the sextant over and look at the star, then swing the arm (now on top) until you find the horizon in it. That method is easy and quick: I could shoot four stars in under a minute, with someone to record readings and time. We took morning and evening shots and a noon sun line. I found Hawaii and Japan that way, and felt pretty good about it. Sextants are also used horizontally to measure the angle between two nav aids. LORAN came along, but didn't reach everywhere. Then GPS came into being and made life simple. Navigational accuracy went from maybe 25 miles to 25 feet. But the sextant was there to keep the navigator cool — watch him start to sweat as overcast days continued. My daughter, Liz, loves to sail and had been dreaming about it all summer. She was interning at a golf course and had no time to come back home to sail with us. Liz Bauernfeind, Steve Pembleton, Tim Bauernfeind, and Sharon Pembleton (Steve's wife) ' notice who has the biggest smile! Steve, Sharon, Terri Bauernfeind (Tim's wife), and Liz with Holland's famous 'Big Red' Lighthouse in the background. Last January, I began an email conversation with one of our Good Old Boat subscribers, Steve Pembleton, who wanted to use the Kindle app to read our digital issue on his iPad, but couldn’t get it to work right away. Much to his credit, Steve persisted and by “MacGyvering” a way was finally able to read the January issue using the Kindle app. I applauded Steve and asked him to share his procedure, so I could help other readers too. As we learned better ways to prepare and deliver the digital issue, Steve told us that we had now made it much easier for him to upload and read the magazine. He thanked me for the help (I thanked him) and Steve offered to buy me dinner if I was ever in Holland, Michigan. “Great,” I said, “That could happen because Liz goes to school at Ferris State University in Big Rapids, Michigan, and we drive right by Holland on the way to Ferris.” After Steve downloaded the March issue, he mentioned that he just bought a new boat, a 1986 Catalina 34, pending sea trials. The May issue rolled around, looked great on Steve’s Kindle app, and his C-34 passed the sea trials. Steve reminded me of his dinner offer and extended it to a sail on his new boat. I told him that we were planning to visit Liz sometime in August. In the meantime, Liz kept reminding me of her dreams about sailing and how she would love to have a chance to sail on Lake Michigan. So in August, we all had a great late afternoon/evening sail out of beautiful Holland, Michigan, on the Pembleton’s new boat, Perseverence. I’ll save the rest of the “MacGyver” story about how, after our sail, Steve and his perseverance opened the trunk of my car with a paper clip after we locked the key in there! Have you seen a name you thought particularly clever or meaningful? Send a photo of the boat and its name to Karen@goodoldboat.com. Though there is no photo, Harry James sent his favorite boat name and we couldn’t resist sharing . . . Never Again III.